Liberia's information minister has admitted that the country's health care system has been overwhelmed by the spread of the deadly Ebola virus. Lewis Brown told the BBC the system had been "overtaxed" by the outbreak, but that authorities were doing their best in the face of an unprecedented crisis. The medical charity MSF said officials underestimated the outbreak and that the health system was "falling apart". 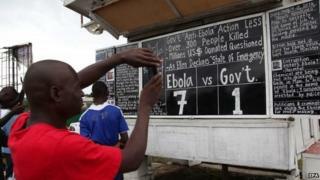 Nearly 1,000 people have died and 1,800 have become infected in West Africa. The Ebola outbreak - the worst ever - is centred on Liberia, Sierra Leone and Guinea, but has spread to other countries in recent months. Mr Lewis told the BBC that the outbreak was affecting Liberia's most populated areas, and that people there were "in denial". "There are religious practices and beliefs, long-held traditional values that are being challenged by the procedures... to cure or at least prevent the spread of disease," he said. He said Liberia's health care system was "not the best in the wold", but rejected accusations that it had not responded quickly enough. The crisis, Mr Lewis added, would have "overstretched and overtaxed" any health system. "The bottom line is we are at the frontline of a deadly outbreak," Mr Lewis said. Earlier, the co-ordinator for Medecins sans Frontieres (MSF) in Liberia, Lindis Hurum, told the BBC: "Our capacity is stretched beyond anything that we ever done before in regards to Ebola response." She said five of the biggest hospitals in the capital Monrovia had closed for more than a week. "Some of them have now started to re-open but there are other hospitals in other counties that are just abandoned by the staff." On Saturday demonstrators in Liberia blocked a highway, saying authorities had not been collecting the bodies of some victims. The army was then deployed to restrict movement, particularly from the worst-affected provinces to the capital. Meanwhile Guinea has denied earlier reports that the government had sealed borders with Liberia and Sierra Leone. "Guinea has not closed its borders with Sierra Leone or with Liberia. It's rather that we have taken health measures at the border posts," it said. The Spanish government says a Roman Catholic priest, infected with Ebola in Liberia, will be treated with an experimental drug, Zmapp, in a hospital in Madrid. The drug has been used in the US on two aid workers who have shown signs of improvement. In Canada, test results on a patient being treated near Toronto after returning from Nigeria with flu-like symptoms have shown he does not have the virus, officials said on Sunday.